An inspiring and poignant chronicle of the global initiative to eradicate polio, from world-renowned photographer Sebastião Salgado. In a world convulsed by war and hatred, the Global Polio Eradication Initiative stands as a rare and inspiring example of what can be done when the world works together against a common enemy. Sebastião Salgado, known for his unflagging dedication to bringing much-needed attention to the world's dispossessed in Workers (1994) and Migrations (2000), traveled to five polio endemic countries to photograph the campaign, begun in 1988, to eradicate polio by 2005. Salgado documented such obstacles as armed conflict, harsh weather conditions, and sprawling poverty in the Democratic Republic of Congo, India, Pakistan, Somalia, and Sudan. Inspired, Salgado noted that, "In my work, I have documented terrible atrocities…overwhelmingly caused by humankind…The immense efforts to eradicate polio have renewed my hope, my faith in solutions." The book includes a substantial essay by Indian public health writer Siddharth Dube, who was born on the same day in 1961 that his brother was diagnosed with polio. The book also includes a comprehensive history of the disease presented in the form of an illustrated timeline. Information on how to help, a bibliography, and donor information are also included so readers can learn more and contribute to the campaign. 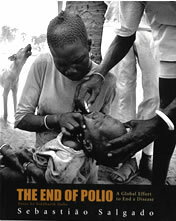 THE END OF POLIO is an inspiring testament to the possibility for successful cooperation between nations and communities on local through global levels, as well as an important volume for those whose lives have been touched by polio.